Excellent, alternative and refreshing vampire film, with an intriguing premise, stylish direction, and some satisfying, choppy violence. A month-long polar night in the small Alaskan town of Barrow gets nasty as well as cold when a herd/troop/flange (insert your collective noun for vampires here) of bloodsuckers descend on the place – and boy, are they hungry. The vampire genre, much like the zombie genre, is pretty much dead (boom-tisch!) these days. It’s hard to get interested in another take on the fang-toothed undead that does not seem a variation on some approach already taken. Welcome, then, is 30 Days of Night, which strands a bunch of humans in a snow-bound town in perpetual darkness. 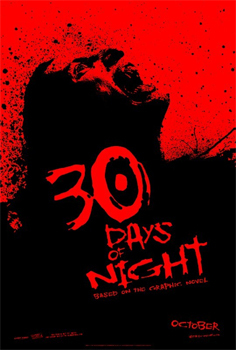 30 Days whips along at a cracking pace, and very soon into the film most of the town has been decimated by the fierce, multi-fanged vampire clan led by Danny Huston. Up against them is Ashton Kutcher‘s sheriff, his estanged wife and small bunch of survivors moving from house to house as they wait out the month until the sun returns. While the vampires have speed, agility and strength on their side, the survivors have local knowledge of both Barrow and the weather conditions to aid them in their struggle. Circumstances continually force their hand, of course, and their numbers dwindle as they lose more and more each time they move on. The vampires also get it a bit too – spectacularly torn to shreds by snowploughs, axes, and assorted crunching machinery. A final, unexpected showdown concludes the film just as the sun returns. Brit director David Slade does a superb job creating atmosphere and gives his film a real style, making the vamps extra menacing by having them communicate in their own, feral language and filming them in such a way to give them a hungry, kinetic desperation to their movement. And for a film set entirely at night, it’s lit very well, meaning you don’t miss a drop of the red, red blood sprayed, pumped and drank. Originally a rejected screenplay that subsequently became a successful graphic novel, it rose again as a film thanks to Evil Dead-ites Sam Raimi and Rob Tapert’s Ghost House Pictures. 30 Days delivers in much the same way Raimi’s own, post-Spider-Man stylish horror Drag Me To Hell – a novel approach, assured direction, and a respect for the audience. Recommended. Once of Croydon, UK. Now of Copenhagen, DK.